Screening is the most important stage in a circuit to achieve these results. Welcome to the world of our Horizontal screens. 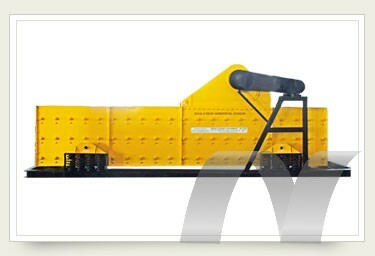 Our Horizontal Vibrating Screens can be used in different operations such as feeding, crushing, classifying and processing of raw material from river bed and quarries in order to obtain the required product size and quality. Horizontal screens have found many useful applications; High productivity and better screening are few of the many advantages of horizontal screens; in mobile applications or application with restricted head room, the answer is our Horizontal screens. Extreme importance has been given to the conceptualizing of the inclined screens; from the heavily reinforced decks to the ultra low maintenance shaft mechanism. The Shaft mechanism consists of a heavy duty eccentric shafts mounted on premium imported spherical self aligning bearings. With the help of modern computer techniques, exact placement of the shaft has resulted in extra ordinary screen performance. In effect, lower power consumption, Lower electricity bills! Our horizontal screens are available in single, double, triple and four deck configurations.